The Hobgoblin pub in Brighton has undergone some exciting changes recently. An escape room has opened upstairs and a new kitchen has moved into the garden. Keeping with the street food vibe, ‘Doughbo’ has taken up residency. Doughbo is the brain child of two friends – David and James – who decided to start cooking together after a few pints, a bad takeaway and for the mutual love of good food. 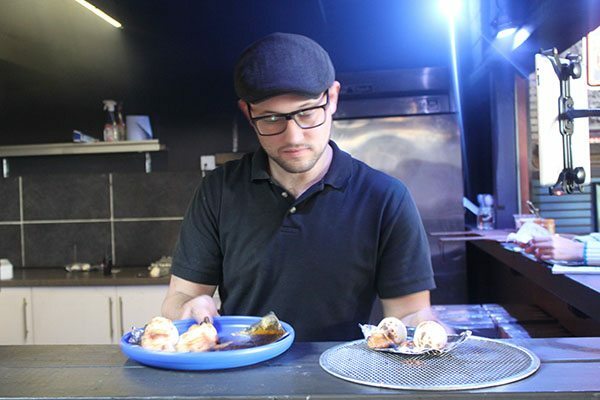 Selling their first doughball at a food festival in Shoreditch, then moving into a trailer near London Road and now working out of the shack in The Hob’s fantastic, all-weather, beer garden, this new kitchen offers hearty grub to suit all taste buds and bellies. 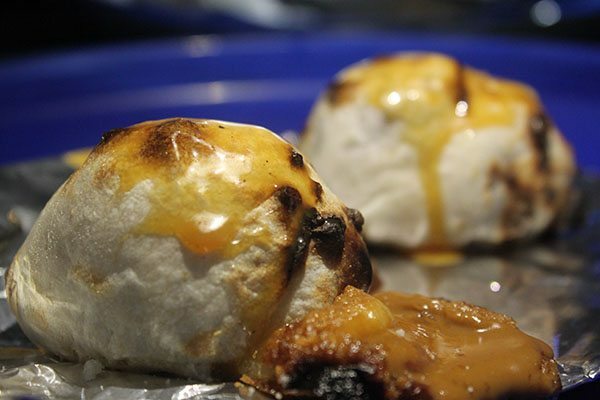 Doughbo is in short gourmet dough balls – which could be described as mini calzone – with a plethora of inventive fillings. You order six dough balls of your choice from the menu to share with friends or as a more formidable platter for one. It’s a simple but interesting concept that I was up for trying. The array of adventurous fillings simply added to the appeal. I visit Doughbo on a Friday lunchtime – lunch is served from 12 to 4pm. The lunchtime menu consists of six different dough balls, two of which are sweet the rest are savoury. There is also a daily special on the board – today it is ‘Carne Con Chilli’. You can choose a mixture of any six dough balls for £5, which to me seems incredibly reasonable. As well as this, if you visit Doughbo for dinner, the menu has an additional five, completely different fillings available. These come in the shape of one sweet – ‘Mumma’s Apple Pie’ – the rest savoury – ‘Mother Clucker’, ‘Reggae Reggae Chicken’, Carne Con Chilli’ and ‘Med Veg Roast’. You can pick any six of these (including what’s available on the lunch menu), for £8 from 4 to 10pm. Thinking of everything, the guys at Doughbo have also created three perfect dipping sauces to accompany their dough balls (£1 each). I’m feeling unusually hungry today. I make the decision that my partner and I will order six of the lunch doughballs each. I order one of everything for me and exchange the ‘Italian Mushroom’ for the daily special ‘Carne Con Chilli’ for my partner. I also order all three of the dips to try. The doughballs are prepared in the kitchen inside the pub, but are cooked in the shack in two wood fire ovens. These generate a lot of heat and a fair amount of smoke, so I wouldn’t recommend sitting too close to where the magic happens. James oversees the cooking today and stays in touch with David in the kitchen via a walkie talkie. It’s a well-oiled machine and soon enough our balls our ready and delivered to us on a sheet of tin foil on top of a Frisbee. This is certainly the first time I have been served a meal on a Frisbee and give the guys 10 out of 10 for originality. Wanting to take in all the flavours and fillings, I take one ball at a time. The first is ‘Italian Mushroom’ (vegetarian/vegan) which is stuffed with Portabella Mushroom, herbs, sweet Italian tomatoes, basil and mozzarella. This is David’s favourite doughball and the filling he feels most proud of as it has converted many a mushroom hater. I am no mushroom hater, in fact I am quite the opposite, but if I were, I imagine that he could add me to that list. The mushroom filling is full of flavour and works well with the tomato and mozzarella. This is more like a traditional pizza topping, so with the fluffy, crispy, light Neapolitan dough there is little to dislike here. Next up is the ‘Absolute Porker’ with slow cooked pulled pork, maple bourbon BBQ sauce and mozzarella. Less conventional, but no less successful as a filling. This one has James’s vote and involves slow cooking the pork for up to 15 hours and then adding their homemade and much-loved maple bourbon BBQ sauce. The result is a rich and moreish doughball, with subtle, sweet notes of the bourbon complementing the super tender, slow cooked pork. If I had to pick a favourite, it would be this one (but that’s only if I had to!). The ‘Cheesy Nutter’ (veg) packs a punch with blue cheese, pear soaked in cider, roasted walnut and – you guessed it – mozzarella. I will always favour strong and adventurous flavour combinations and this dough ball has it all. The creamy blue cheese takes the lead, working in perfect harmony with the sweetness of the pear and cider and the crunch of the walnuts. Enter the homemade ‘Carne Con Chilli’, a doughball for all meat lovers. Wonderfully flavourful chilli, cooked in craft beer with kidney beans and tonnes of meaty greatness bursting out with every bite. Finally, and another more conventional filling – the ‘Parma Royale’ – keeps things simple with salted Parma Ham and more mozzarella. For those looking for something less bold, the Parma Royale’s your man and another great addition to this ‘all bases covered’ menu. The sources round everything of nicely; each one great at accompanying all the different doughballs. My two favourites are the ‘Maple Bourbon BBQ’ and ‘Garlic White Miso’, which is an utterly garlicky experience. Now for dessert. Two chocolatey doughball explosions awaited us. ‘The Nuke’ (veg) filled with white and milk chocolate and drizzled with salted caramel and the ‘Biscoff That’ (vegan) filled with biscotti spread. Both super naughty and super sweet, they would satisfy even the sweetest tooth. These are a joy to devour with the golden, airy light dough encasing all the good stuff – perfect pockets of foodie greatness. Job done! The Hob Goblin is the perfect venue for this kind of dining – relaxed, sociable, affordable dining. The menu is fun, the concept is fun, this is proper get your hands dirty kind of dining. It’s a concept that could continuously evolve and in fact the guys want it to. They tell me that their customers – the ‘Doughbo Family’ – play a part in the creation of new filings. ‘They continually come up with amazing filling combinations that they’d love to try. The flavours are then tested and if they are loved by everyone, they make it onto the menu and the creator gets to name the new doughball. 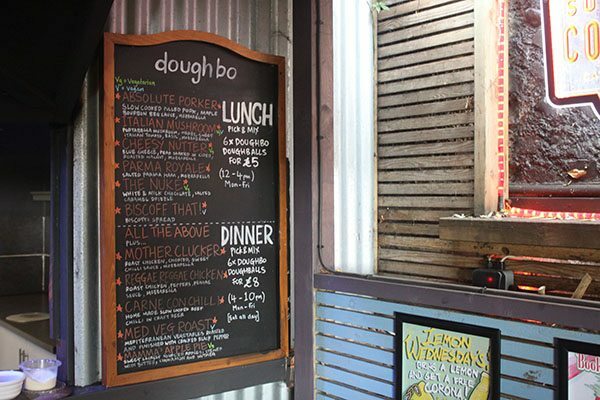 We want the Doughbo menu and business to involve as many of our customers as possible’. Along with inventing the world’s first ‘Doughball Roast’ – a selection of classic roast fillings (meaty, veg, vegan) popped inside dough balls, teaming up with Deliveroo and Twin Pines Coffee House on St. James Street, longer term the guys hope to see Doughbo go national. They don’t lack ambition and I for one hope the future’s bright for Doughbo. This is something we can all sink our teeth into, and you never know, if you feel inspired, your creation could end up on the menu!